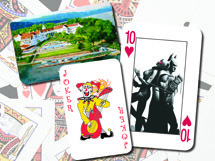 Customizing the faces (pips) of the cards is a great way to promote several products or services. We offer fully customized card faces, with both traditional and custom suits, in one, two, three, or four colors (full color). Faces are lithographic printed on brilliant white stock with plastic coating, and can have a smooth or linen finish. Prep charges will apply, and there is a 400-deck minimum order. Please contact us for a quote. Pips, commonly called faces, are the symbols on the card face that determine the suit of the card and its value. We offer pinochle, regular, and jumbo pips. Regular and jumbo pips are available in both bridge- and poker sizes. Pinochle pips are available in bridge size only.